Our Simple Basics feature makes the fun and hot trends you find in scrapbooking easily accessible through step by step tutorials. Today I'm going to show you how to make your own envelopes for cards or hidden journaling on your layouts. Sure you can buy fancy envelopes, but do they match the Simple Stories lines? I don't think so. But now you'll know how to make your own, our sample is 3.5" x 6". You can make them smaller or a bit bigger using one 12" x 12" sheet. I'm using the new Year•o•graphy line for this tutorial. 3. Trim just a bit off the edges, note how the greyed rectangle in the above image is just a bit larger on the edge? Trim the one edge a bit more, as shown below, this will make the folding much easier. 5. Fold the two sides in, draw a slight curve on the top side of the envelope and cut it out. 6. Do the same for the top and bottom flaps. You can use a corner rounder for this step as well. 7. Glue the center and bottom flap. 9. Punch 2 circles, I used a 3/4" punch. Add a brad to the center of each circle, apply a pop dot to the back of each circle. 10. Attach the circles to the flap and the back of the envelope. Wrap with a bit of twine to hold closed. 11. Decorate as desired, and you are finished. Now you have a custom made envelope to match the line you are working with. Pretty cool, huh? I am in love with fall, this is my very favorite time of the year! I don't know if it is the cooler weather, or the changing colors, or maybe it is that there are so many activities to do; from corn mazes, to Haunted Houses, or going to the pumpkin patch, to carving out the perfect jack-o-lantern! Then I realized , everything we do in the fall has to do with being together with friends and family. I think that is another reason why I love the Generations collection, it is all about family! Sue Kendell created this fabulous layout that fits into a 12x12 frame, using the Generations collection for her home. Another project Sue created using the Generations collection and a 7 Gypsies vintage receipt holder; is this one, using her sons senior year pictures. With so many things to be thankful for at this time of year, family is amazing! Go out and create a fun family memory this weekend, and then document it with our beautiful Generations collection. Hello All! Wendy here with a project share using the NEW Year.o.graphy collection! This collection is absolutely perfect for just that..ALL year! So many sweet, cute, and perfect elements to capture all the memories of the year. I'm planning to use this collection in the coming months for a new project coming up here on the Simple Stories blog. Shhhhh...I can't can't squeak anything about it for now, but I think you're gonna' love it! In the meantime, here's a sweet & simple fall themed ATC (artist trading card) that I created using the Year.o.graphy collection. This was so quick & easy to put together and you can trade it up with friends, ATC collectors, or send it off in an mini envelope as a sweet happy mail for someone special. If you are a fan of ATCs, be sure to check out my other post here using the Happy Day collection. Oh my, oh my, they have done it again! Simple Stories has hit another home-run out of the ballpark with the new Year.O.Graphy Collection! My first thought when I saw this new line was of making 2011 Calendars. Of course, it's absolutely perfect for that! But, when it arrived on my doorstep, I was immediately drawn in by the colors, designs and potential for so many other creations! Don't get me wrong, I still have big plans for those calendars, but they will take a bit of planning. Being the impatient person that I am, I just had to dive right in and start cutting that paper! So, here are my first creations with this new line - super quick & easy! As you can see, I literally cut out the cards, added a few details and glued it to a card background! So cute and so easy! The Simple Stories Year·o·graphy collection and system make it easier than ever before to capture, document, and share your memories in a simple, yet meaningful way – but without all of the time, guilt, and stress! 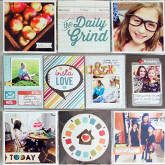 If you are looking for a fun and quick weekend scrapbooking project look no further than the Simple Stories Year.o.graphy collection. We created a helpful and beautiful Idea Guide that will inspire you with ideas to showcase memories all in one album using the Simple Stories Year·o·graphy kit. Download your free idea guide by clicking here. Sharing your memories has never been easier! Hello all! Wendy here with a twist for ya' for today's "Simple Basics" post. I'm really on a ATC kick lately and was inspired to create up a couple to share up with you in a quick tutorial using Happy Day collection. I love the challenge to create a mini version work of art. The 6x6 paper pads available now by Simple Stories are the PERFECT size for mini versions of art! These pads are packed to the max with 36 sheets of fab papers! What I love about the Happy Day collection is that it's so full of color, cheer & celebration! You can use it for just about anything celebratory, not just for birthdays. Step 2: Select your preference of ATCs. I used the ATC size sticky back canvas and attached to a sturdy ATC mixed media & collage board. The can usually be found at your local hobby/craft store/online. Step 3: I selected the calendar paper from the pad. I cut out the July calendar (the month of my birth :-)) LOVE these mini calendars! Step 4: On the canvas, spritz your favorite mist. Step 5: Stamp in the upper right corner of the canvas. I used a technique of stamping once and repeated stamping without re-inking the stamp for the faded effect you see below. LOVE the Unity Stamps co-brand Simple Stories. Excellent quality & just stamping perfection! Step 6: Here I used another stamp from Unity Stamps co-brand Simple Stories and stamped directly on the mini calendar cut out in Step 3. Step 7: Here is the finished ATC! anddddd as a BONUS....here is another ATC I created up to share with you! Also, used the Happy Day collection and Unity Stamps co-brand Simple Stories. Sticky Back Canvas ATC - Ranger, Mixed Media & Collage ATC - Crescent, Adirondack Color Wash - Ranger, Ink - Ranger, Tape - Advantus - Tim Holtz, Bling Cherries - Advantus, Pearls & Bling - Kaisercraft, Want2Scrap. We have a winner . . . well a few winners! We could not be more excited about the wonderful comments that everyone left on our blog as well as on our Facebook page about our new Year.o.graphy collection! "Oh my...OH my...OH MY... This is a **must** have for every scrapper especially those that think they don't have the time! You hit it out of the park again Simple Stories! Just beautiful... your collections always inspire me to create!!! Can't wait to get it and get started!!!" "oh wow, I totally love it, everything in there is just perfect, I love the idea of scrapping each month of the year and the calendar is such perfect addition! Can't wait for this to be released"! "Oh wow!!!! This is by far my favorite Simple Stories collection!!! I just heart it so much!! The colors and patterns are simply fabulous!! Thanks 4 the chance!!" Now, for the random WINNER of our new Year.o.graphy collection (insert drum roll here) . . . "WOW!!!! Could these be ANY CUTER?!?!?!?! I just love all the graphics, this collection really makes me smile :)"
But wait we also had another giveaway on our site this last Thursday! Congratulations to Lindsey Slater who said "Love the projects! Thanks for organizing the blog hop! The receipt holder is beautiful! I think I have an idea for some Christmas presents now!" Congratulations to Lindsey Slater and Nora Anne!!! Please email your address to: sales@simple-stories.com, this week so that we can get your kits mailed to you. We truly are flattered by the comments everyone left! If you didn't win this time, make sure to try again on our next giveaway! Hello! I'm excited to share with you another installment of Simple Creative! This is where we focus on the pre-designed elements in the Simple Stories Collections but not in the traditional manner. Of course the elements are perfect for scrapping with divided page protectors, but what if you are a full size 12x12 scrapper? Well, let me show you a great way to use the elements on a basic 12x12 layout! I placed all these elements together on my page and added in some additional embellishments from the Cardstock Stickers and Expression Stickers! I love the versatility the pre-designed elements give me when I'm creating! Life is truly worth celebrating! With Simple Stories 4 new collections released at the CHA Summer show; we are making it even easier to document those celebrations from a babies first year, Family Memories, Christmas, and Birthday Parties! For the last and final blog hop visit, we wanted to showcase some of the fun examples that our staff put together for the Summer CHA show from each of the 4 collections! Take a look at this fun banner from the Generations collections. I think this next project would be the perfect gift for that first time mommy! Our Baby Steps collection is very gender neutral, making it perfect for a boy or a girl! Last, but not least; check out this fun Birthday Mini book, perfect for remembering all those fun Birthday celebrations! Thank you for coming on our blog hop with us today! We hope you have enjoyed it, and found some simple inspiration to document life's celebrations along the way. Would you like to win one of our Happy Day collections? Simply leave us a comment and we will pick a random winner. Comments will close Thursday at midnight.